Koroleva Ekaterina Yu. 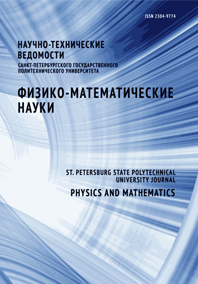 Tryukhan Tatiana A. Baryshnikov Sergey V. Stukova Elena V.
The temperature and frequency dependences of dielectric properties of (NaNO2)1-x(BaTiO3)x ferroelectric composites have been studied. It was shown that in the composites as well as in solid solutions, the mutual influence of the components may lead to the expansion of incommensurate phase existence in NaNO2. The greatest contribution to the low-frequency dielectric constant of the composite is due to the Maxwell-Wagner polarization.